Erbil Citadel is a fortified settlement on top of an imposing ovoid-shaped tell (a hill created by many generations of people living and rebuilding on the same spot) in the Kurdistan region, Erbil Governorate. A continuous wall of tall 19th-century façades still conveys the visual impression of an impregnable fortress, dominating the city of Erbil. 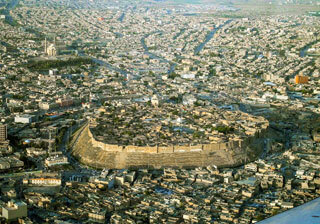 The citadel features a peculiar fan-like pattern dating back to Erbil's late Ottoman phase. Written and iconographic historical records document the antiquity of settlement on the site - Erbil corresponds to ancient Arbela, an important Assyrian political and religious centre - while archaeological finds and investigations suggest that the mound conceals the levels and remains of previous settlements. This article uses material from UNESCO World Heritage List article "Erbil Citadel", which is released under the Creative Commons Attribution-Share-Alike 3.0 IGO License.